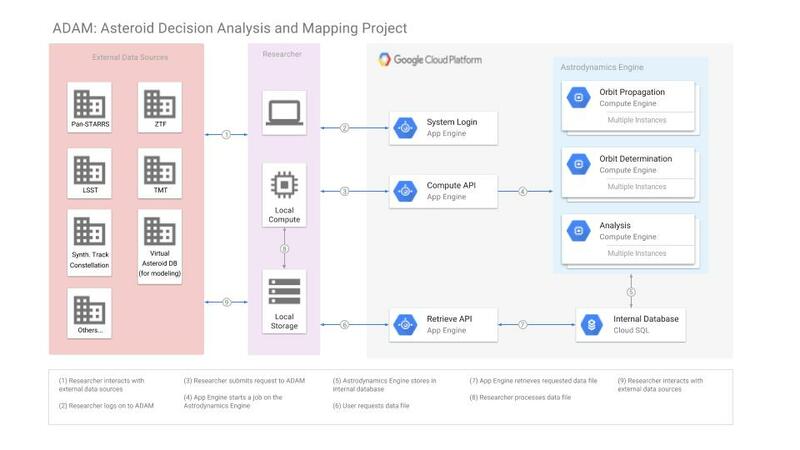 The B612 Asteroid Institute’s Asteroid Decision Analysis and Mapping (ADAM) project continues to make progress building the application and interface layer to access and make sense of the data comprising an asteroid map. The sharp-eyed among you may have noticed that the acronym for our ADAM project has evolved (replacing Machine with Mapping). The reason for this can be summarized by our recent op-ed in the Financial Times on the need for mapping the asteroids in our Solar System. The process of building a map requires two things, a means of gathering the data on the locations of objects of interest and a set of tools for accessing, analyzing, and comprehending that data. The job of gathering the data on the locations of asteroids is, of course, the work of telescopes like PanStarrs, Catalina, Linear and in the future hopefully NEOcam and others. These discoveries will soon be greatly accelerated when the LSST telescope comes online in a few years. Should the Asteroid Institute’s work on synthetic tracking continue to pan out, we could even have a further acceleration of the asteroid discovery rate forthcoming. However, a map is more than just a collection of data. And here is where our ADAM project comes in. ADAM is taking these enormous number of asteroid observations, and making the information actionable and extensible. By building tools for calculating orbits and trajectories, and allowing others to build upon the map with these tools (and even adding their own data), we are building the 3-dimensional dynamic map of the Solar System that will be the key to future scientific discoveries, economic expansion, and of course protecting the Earth from asteroid impacts.